"Click" onto "Our Store Front"
Announcing new additions to our page. On the link below, you can download a list of parts for Detroit Diesel engines. Simply click on the link. Bear in mind that some of the prices listed change constantly which makes updating difficult. Please call for current prices. On large orders, we drop ship from the factory, saving you substantial freight costs. Detroit Diesel guarantees their products for one year, the BUS SERVICE guarantee is for two years! And the best part is that our wholesale pricing is substantially less. We will be uploading our latest price sheet in the near future. Check back for the prices. In the meantime, please feel free to call for pricing and availability. 6V92 The price was so great we couldn't keep them in stock!! We'll post an update when we've received a new shipment! THIS IS A SPECIAL INTERNET PRICE!!! These engine stop cylinders are the product of our quality reman process that we are known for. Among many, many unusual engine parts, we offer new and reman. aluminum valve covers for 8V, 6V, 71 and 92 series engines, with or without breathers. . THIS IS A SPECIAL INTERNET PRICE! Like our engine stop cylinder, these cylinders are rebuilt in our shop using all new parts. Guaranteed. A core charge of $15.00, in addition to the internet price, is refunded upon receipt of core. Even though cold weather has not yet arrived, it is never too early to check your engine block heater. Don't find out you have a problem when you need it most. We have engine block heaters in stock for both Detroit Diesel and Cummins engines. In the event that your cord is bad but the heater is good, we have a limited supply of cords separately. Specify part number when ordering. Engine Blowers - When looking for engine blowers, know what you are buying. Our blowers are rebuilt to original specifications, incorporating the latest updates, an using factory components. Blower rotors are checked for proper clearances and are aligned with blower shafts and couplings. We stock blowers and all component parts for Detroit 6V, ,8V71 and 92 series engines. Series 60, 6V - 8V , 71 and 92 series water pumps are stocked and available for immediate installation. 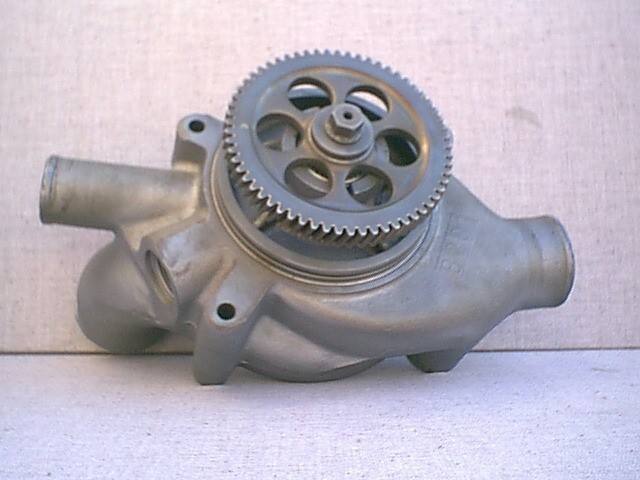 Our water pumps are rebuilt utilizing the newest updates and are sold complete with gear. In addition, we stock silicone hose and hose clamps which should be evaluated for change when re-installing your new rebuilt pump. For all diesel engines. Fuel, air, chemical coolant, transmission, hydraulic, standard oil and remote oil filters. Additionally, we stock cartridges for remote fuel filter separators. If you have a mature coach, we stock the older style cartridge-sock style and element type oil and fuel filters. 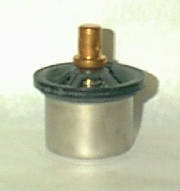 The oil filter elements come complete with all gaskets necessary. 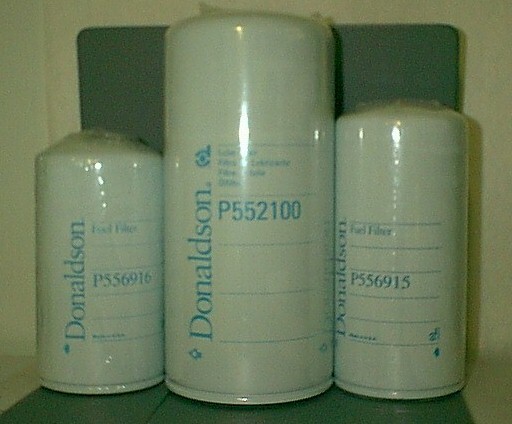 We have the kits for updating the cartridge type oil filter to the new standard spin-on. Looking for air cleaner filters? We also have significant stock on the common air filters. If you are looking for either primary or secondary fuel filter housings for replacement or upgrades, you need look no further. Specify housing type when ordering. We stock all the parts you need for your thermostat replacement. Our thermostats are specially designed for rapid warm-up. Why settle for anything less than the best? Both large and small parts, we have a good cross section of essential engine parts. We stock gears, injector and exhaust rockers, camshafts, fuel pumps, engine shut down cylinders, governors, and much, much more. Call or e-mail us for items not listed.